In mid-2012 I spent two months in the UK. While I was away my landlady renovated the bathroom. I wasn’t consulted on anything other than the timing. I returned to a new bathroom with every fitting replaced. There was just one niggly-naggly little problem: the new basin had a mixer tap and I couldn’t get more than a trickle of hot water from it. It seemed churlish to complain when every other aspect was amazing. I assumed it was just one of those things, an old building, maybe the pressure just wasn’t there. I had a few house guests over the next couple of years: intelligent, practical people, much more experienced in home renovation and maintenance than I (not to mention holding quite a few dan grades and PhDs between them). No-one mentioned the lack of hot water in the basin. A couple of months ago it occurred to me to look for isolator valves to adjust the flow – perhaps you’ve guessed I now enjoy an abundance of hot water in my bathroom basin? It puzzled me that a bunch of us simply accepted things as they were. And it made me reflect on how much we take for granted in our training. As students we tend to assume that what we are first taught is definitive. This is especially true of students who believe (or have been told) they are learning the “one true way”. I’ve been an enthusiastic advocate of a number of these one-true-ways. Many thanks to those teachers and colleagues who have dumped me, along with my assumptions, on my arse. As instructors we realise we can initially transmit a provisional understanding only. We have to present something that can be built upon and that doesn’t impede future development. So, how to avoid the abject mediocrity of assuming we already know? I don’t believe the answer lies in challenging and questioning. It seems to be the fullest cups who challenge and question the most. I wonder if the answer lies in simply being curious, allowing the possibility that there is more we don’t yet know. This requires not “knowing” the outcome ahead of time in every single partner practise. I was discussing this with Dan James of Aikido Republic, co-founder of Great Ocean Aikido Community. I related that a former teacher would speculate whether people claiming 20 (or whatever) years of training had twenty individual years of development, or just the one year twenty times over. Dan’s comment was that if we are still doing what we were doing 12 months ago we are stagnating! While it’s essentially the same comment, it made me think hard about my last couple of years of progress, and commit myself to continue looking under the basin. Interesting thoughts. 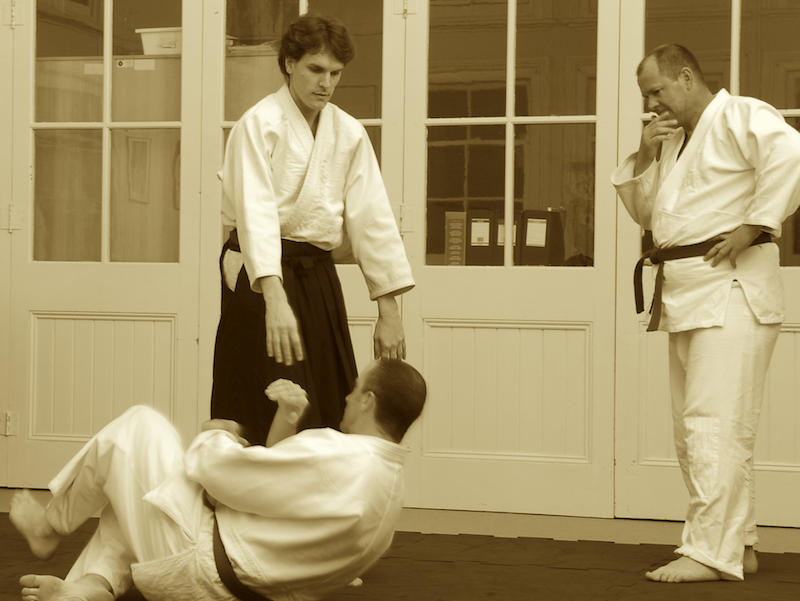 Why train / practice Aikido? Many answers to this and all very relevant. All answers to this one question are correct. If the answer is for self-defence., then best make sure the basin is REAL and not imaginary, for as you train / practice is how you will react when your skills are needed. Don’t be fooled by the imaginary basin. Sadly most practice Aikido and only see / do the top part of the Iceberg. 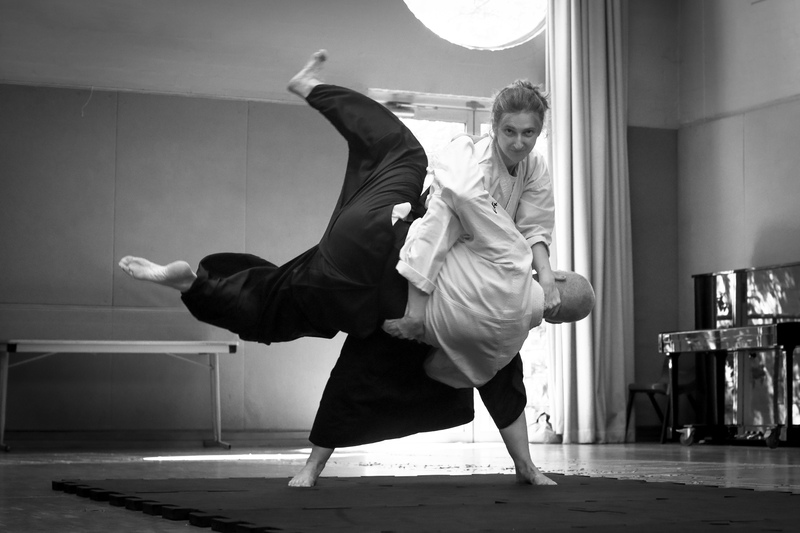 The real part, the big part of Aikido is hidden, just like the Iceberg under the waterline. It never occurred to me to look under the basin, nothing had functionally changed since my last visit to that bathroom (and despite said certificates from learned institutions) I had no expectation of change, except that everything was very shiny. An expectation of change and looking under the hood and being curious might have changed all that. But enough of the analogy though its a bit like going to many an Aikido seminar perhaps? I’ve since made it my mission to go and feel the technique and ask. Sometimes it earned my a grumpy kick in the ribs (like from my former teacher), sometimes the curiosity was welcomed. Osu! If you see aikido as an individual pursuit, having little or nothing to do with organisations, there is a kind of “misogi” involved and you can look at things differently, without necessarily running from dojo to dojo. Sometimes you can do the same thing you have done for years, but see it differently. Same basin, different angle of view. I have a feeling the answer lies inside, i.e., changing oneself, not outside, i.e., changing training systems or regimes. But we have to keep asking the questions and looking under the basin, as Andrew is doing so well. Good show.